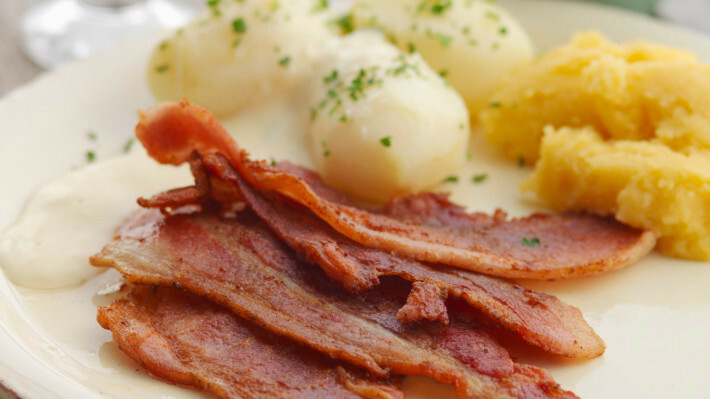 For generations, Flesk and Duppe (Pork and Sauce) has been among the most popular traditional Norwegian dishes – although the sauce may vary from family to family. Pork is a great source of proteins, and the vegetables are rich on iron, calcium, potassium and vitamin A. This is a very simple and tasty dish from the Norwegian cuisine. Peel and boil the potatoes and carrots. Make a plain white sauce by melting butter in a saucepan and wish in flour. Gradually add milk, stir well. Bring to a boil so the sauce thickens. Note: Stir constantly over low heat or it may burn. Cut the rind of the pork and cut them into thin slices. Fry them on both sides in butter. Add the fat from the frying pan to the white sauce. Season with salt and pepper. Add finely chopped parsley if you like. Serve with boiled potatoes, boiled carrots or swede mash (see recipe below). Peel and cut the swede and carrots ​​into dices. Boil them until soft in lightly salted water. Pour out the boiling water and mash the vegetables. Add cream and butter, and season with salt and pepper.